On this date, the 1st of December in 1995, our great-uncle Charlie passed away and is buried at Flynn Cemetery in Agra, Oklahoma. 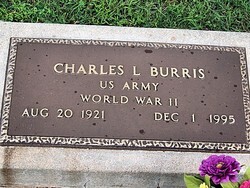 Charles L. Burris was born on August 20, 1921 to parents Asa Azil Burris and Rosa Pearl Raabe. He served in the US Army during World War II and was a younger brother to our paternal grandmother Ida Mae Burris. Charles was married to Katherine “Kate” Burris. Special note: We are still researching! Comment if you have more information to share.